How do YOU Capriccio? 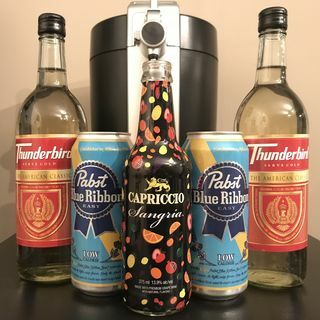 Capriccio Sangria has taken the world by storm and has even been called a new "Fancy Four Loko" by some people after discovering the level of drunk it can give after consumption. Does it live up to the hype? We are getting to the bottom of this hype train as Bum Wine Bob cracks open a bottle of Capriccio Sangria (It's the bumwinebob.com wine of the week, people!) on this weeks edition of Bumming with Bobcat! What's the word? The NEW Thunderbird wine is ... See More now official! Representatives from E&J Gallo Wines have confirmed that they have changed the classic Thunderbird recipe and that the new version will be available in a Chardonnay, Merlot, and red blend. Could one of these be a throwback to the Night Train Express? Stay tuned as we await more details! We also have the latest updates on the never ending new MD 20/20 Cans saga, new flavored St. Ides malt beverages in hand, THUNDER DEW, and a few more special treats. Hit that play button and make sure to listen all the way to the very end. You don't wanna miss a minute of this weeks show! It goes down nice and easy!